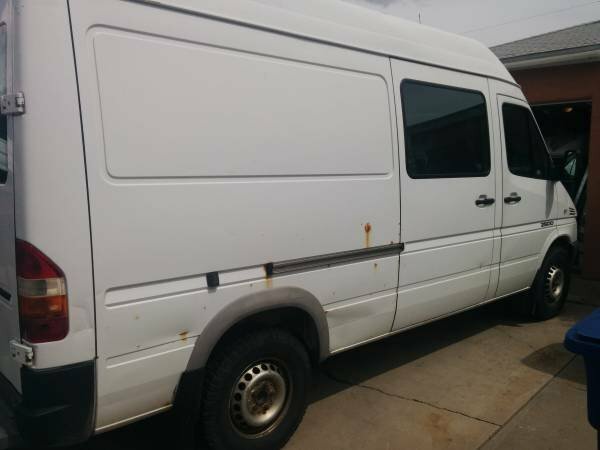 Just posted hours ago on Craigslist [link] could be the deal of the century (or a scam, so beware): A 2004 Sprinter 140 High Roof in Albuquerque, New Mexico for just $3000! There’s no picture from the front so it’s unclear what badge they put on but I assume it’s labeled as a Dodge. The seller added a few pictures from the outside and the inside of this cargo van. The Sprinter has some rust issues bit it doesn’t look serious. The inside looks good, the roof seems to be insulated and there’s no bulkhead divider. Other than the mileage (just 120,000 miles) and the color (white) there are no other details or pictures from the cab which could show more technical details like power mirrors. It has a window in the sliding door and in the rear doors which would save you the work of installing them. The price is just too low but perhaps the seller “forgot” to mention some serious technical issues. So be aware and use caution but someone should call Brad and check out this Van!